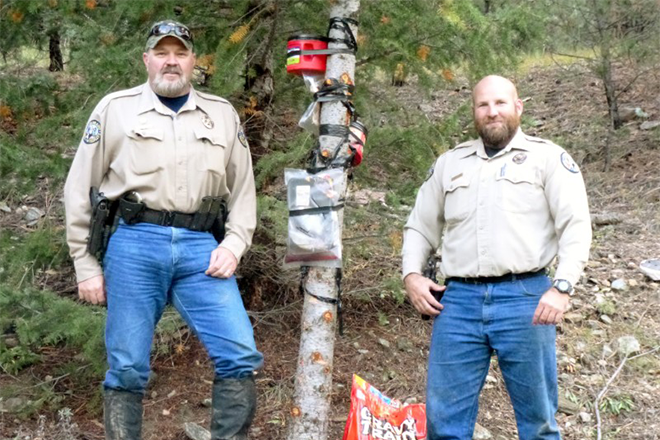 A photo of a salmon fillet held to a tree with black electrical tape made it obvious to Colorado Parks and Wildlife officer Bob Carochi that a poacher was illegally baiting and killing bears in his district. A confidential informant had taken the photo in a remote spot on Table Mountain in rural Fremont County and turned it over to Carochi on Sept. 19, 2017. Carochi, a CPW district wildlife manager who has patrolled the area west of Canon City for 14 years, wasted no time pursuing the poacher. The next day, he and fellow wildlife officer Zach Holder mounted all-terrain vehicles and rode about six miles up Table Mountain. 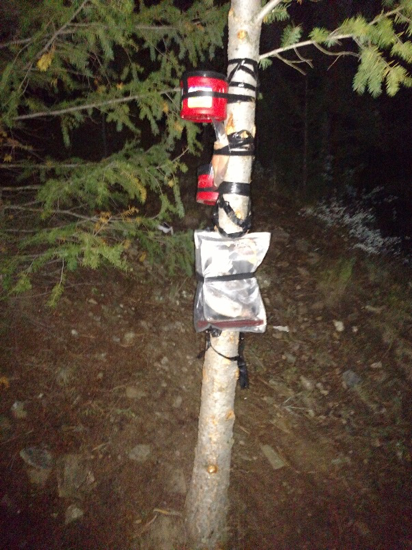 There, they found a hunting blind in a tree overlooking an open area with plastic containers and a bag - all visible in the photo. The salmon fillet, however, had disappeared from the tree. A bear is seen on a game camera eating at an illegal bait site on Table Mountain in remote Fremont County. Courtesy CPW. Carochi and Holder found something else left by the poacher that would play a key role in catching the game thief: a game camera overlooking the site. Carochi turned off the camera, removed its memory card and put it in his own digital camera. 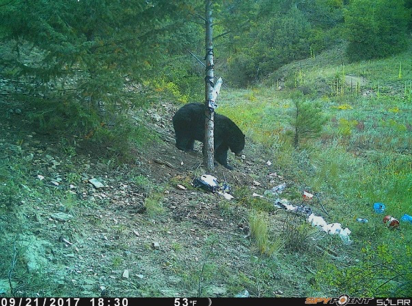 From the information on the photos, he learned it had been put up just four days before and photos showed a bear feeding on the bait attached to the tree. After replacing the memory card in the poacher's camera, Carochi and Holder took their own photos of the scene and put up their own game camera overlooking the blind and illegal bait site. Then came the nitty gritty detective work needed to catch the poacher. Carochi returned to his office near Canon City in CPW's Area 13 and began looking through bear-harvest forms for Game Management Unit 58 where the bait site was located. His research paid off when he discovered that a Salida resident, Ronald Wilkins, had harvested bears from GMU 58 in recent years - 2011, 2013 and 2015. 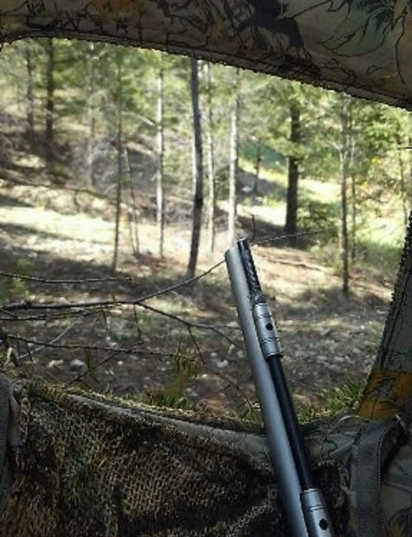 The view of an illegal bait site as seen from inside a hunting blind erected by a bear poacher. Courtesy CPW. Carochi wondered if Wilkins was an especially skilled bear hunter or was using the illegal bait site to poach bears. So he plotted the locations Wilkins had given on his mandatory bear-check forms and found all three came from the same general area in GMU 58. Next, Carochi discovered Wilkins had a current bear hunting license valid for GMU 58. On Sept. 22, Carochi and Holder took their ATVs back to GMU 58. In the parking area for the Texas Creek trailhead, they observed a silver pickup truck. The license plate was registered to Wilkins. The next day, Carochi and Holder returned to find the truck still parked at the trailhead. They rode their ATVs within a mile of the illegal bait site to conduct surveillance. After a few hours, they began riding the trails and came upon an older man dressed in full camouflage, carrying a gun case and riding an ATV. They approached the man and began talking to him. They learned it was Wilkins and he said he was hunting bears with a muzzleloader rifle. Wilkins said he had harvested a pronghorn and mule deer with his muzzleloader earlier in the season and he had a camp nearby, with three game cameras set up, where he intended to hunt with family and friends. Wilkins described how he had killed a large bear two years ago and had the hide made into a rug that was hanging on his wall. During the 10-minute conversation, Wilkins told Carochi and Holder that he lived in Salida. Then he drove away toward the trailhead and his truck. Carochi and Holder, meanwhile, headed to the bait site where they found a new pile of dog food at the base of the tree, a plastic jar of honey and a new fish taped to the tree. Carochi again removed the memory card from the game camera left by the poacher and found images of Wilkins in his camouflage outfit walking around the site. On the night of September 24, Carochi and Holder returned to the bait site, which had been refreshed once again. This time, the memory card on the game camera had a photo of a bear eating the bait. Four days later, on Sept. 28, Wilkins went to CPW's Salida service center to present the head and hide of a bear he had killed for mandatory inspection. As Area Wildlife Manager Jim Aragon processed Wilkins' bear, Carochi and Holder headed to the illegal bait site. The blind and chair were gone, but bait remained on the tree. Over the next three hours, Carochi and Holder found Wilkins' camp, a bag of dog food near the bait site and the remains of a bear carcass. They also found the spot where the bear was gutted. They took photos and tissue samples. Their investigation included opening the bear's stomach to study its contents: partially digested dog food and honey. October 5, Carochi and Holder led a team of Area 13 officers as they served Wilkins with a search warrant at his home. 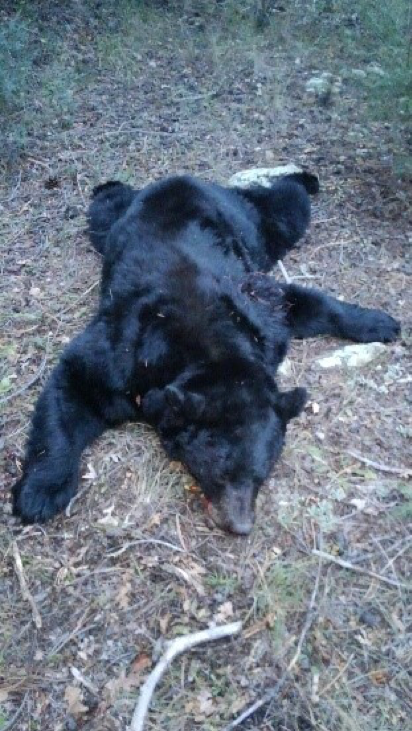 During questioning, Wilkins admitted baiting the bear even though he knew it was illegal. Later, he signed a handwritten confession. Dececember 15, Carochi issued Wilkins a summons for illegally baiting a bear and unlawful possession of wildlife. In late January, Wilkins pleaded guilty to illegal baiting and received a stiff punishment: a $1,400 fine, a 180-day jail sentence and a five-year ban from hunting. "This case is a great example of the work our wildlife officers do on a daily basis," Aragon said of Carochi and Holder. "We pride ourselves on our law enforcement work. And it shows our commitment to stopping poachers." Aragon also praised the person who came forward with the tip and photo of the illegal bait site. "We depend on the timely reporting of suspicious activity by the public," Aragon said. "We have a limited staff and we can't be everywhere. It's critical we get the public's help in stopping crimes against wildlife. When people call, we absolutely respond." Anyone who has information about a possible crime against wildlife is encouraged to call CPW or report it anonymously to Operation Game Thief, a CPW program that rewards citizens who turn in poachers. Witnesses can reach Operation Game Thief several ways including by calling, toll-free, 1-877-COLO-OGT (or 877-265-6648). Verizon cell phone users can dial #OGT. Or send an email to CPW at game.thief@state.co.us .